The project was started in 2003 by then teen birders Raymond VanBuskirk and Ryan Beaulieu. The two teens fell in love with these beautiful birds the first time they visited the feeders at the Sandia Crest outside of Albuquerque. They quickly discovered there was very little known about these birds and they decided to do their own research. The two teamed up with RGBR to begin what would turn into a full fledged ecology study of these amazing birds! In 2005, Raymond and Ryan were in a car accident in Eastern New Mexico while out birding. 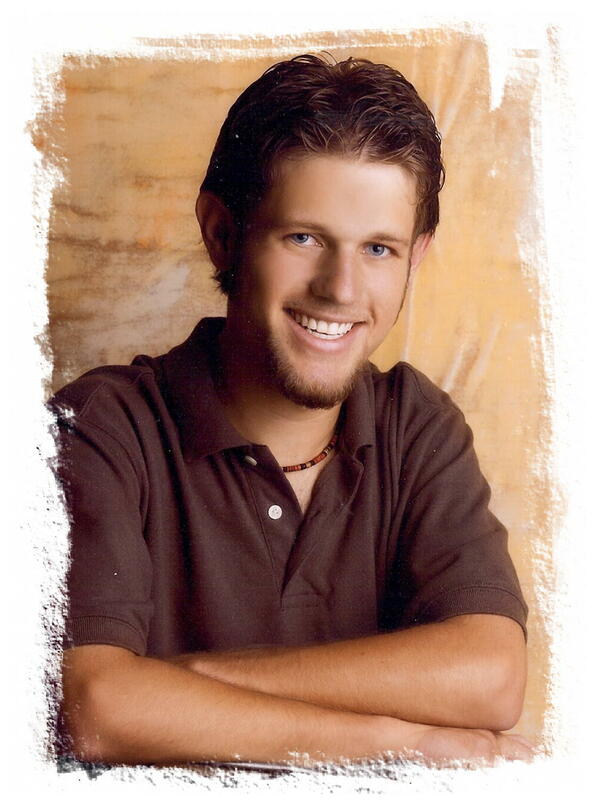 Ryan tragically passed away on August 27th, 2005 and the entire community was shocked. Ryan’s enthusiasm and love for his friends and family, the environment and the Rosy-Finches was contagious and joyful beyond measure. His death was an unfathomable loss to the community and the world. After his death the Rosy-Finch project took a special place in the hearts of RGBR and CNMAS. Today the project is continued in Ryan’s name, there is a plaque in Ryan’s memory that hangs over the Rosy-Finch feeders at the Sandia Crest which is slapped every time a bird is caught and the birds themselves receive a little kiss before they are released, a tradition that Ryan started when the project first began. Click here to see a page dedicated to the memory of Ryan’s life. Raymond brought Michael Hilchey (another young birder who “caught the birding bug” from Raymond and Ryan’s unhindered enthusiasm) onto the project in 2005 and today the two continue the research in memory of Ryan. 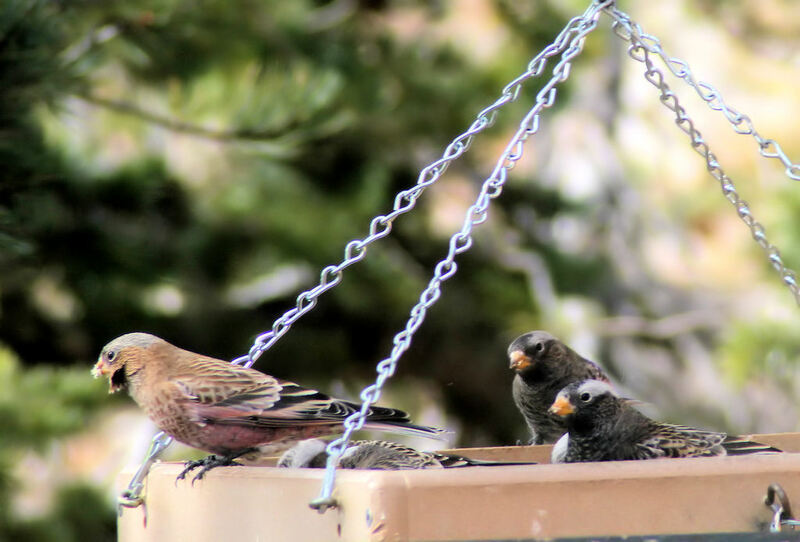 The project is now over 10 years old and, with the help of dozens of volunteers, has grown into the largest Rosy-Finch ecology study of it’s kind and the Sandia Crest has become the premier site to see Rosy-Finches in the world! Raymond and Michael plan to continue to grow the project for years to come. There are three species of Rosy-Finch in North America and at the Sandia Crest, the Black, Gray-crowned, and Brown-capped Rosy-Finch. These birds absolutely gorgeous and highly sought after in the birding world. They breed in tundra habitats from Northern New Mexico north through the Rocky Mountains into Canada and all the up to Alaska and the Bering Sea. In the winter the birds disperse great distances in search of food and they often congregate in large mixed species flocks. Click the links below to see species accounts for each of the three species. First off, they appear to be very susceptible to the effects of fish stocking in high elevation lakes near breeding sites. These introduced fish deplete natural insect hatches that the birds depend on to feed their young and as a result birds are often extirpated from areas where fish are stocked. In New Mexico it is suspected that this may be the one culprit for the nearly complete loss of breeding Brown-capped Rosy-Finches in the Northern mountains. Secondly, these species are at risk from global warming due to their dependence on high altitude habitats. Brown-capped Rosy-Finch in particular has a very limited range and breeds at the very tops of mountain. As the climate continues to warm, tree line rises and the habitat that these birds depend on disappears. 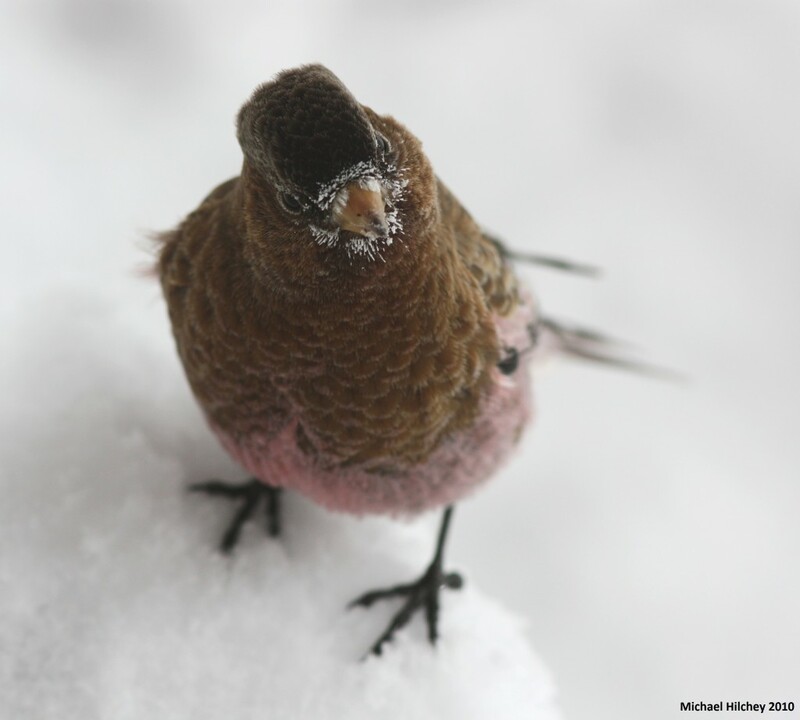 This potentially makes Brown-capped Rosy-Finch a very important indicator species for the effects of global warming on all high elevation species. These threats to Rosy-Finches have very serious implications on the survival of the species and on the health of high elevation habitats all over the world. But we need to know more! That’s where the project comes in. Through the Rosy Finch Project, we are trying to learn as much as possible about these birds. That way, we can better understand how global warming and other environmental factors affect them and we can take steps to prevent losing these beautiful birds. Site Fidelity: Are the same individual birds returning each year? – By banding each individual bird with a unique band we can keep track of how many times each bird shows up a given location. So far the birds have shown some strong site fidelity with some birds returning for as many as 4 years in a row! Longevity: How long do these birds live? – Longevity is a hard thing to measure in the wild. But at a site like the crest where birds have been banded for many, many years some valuable data on life expectancy can be gathered. At the Sandia Crest the banders have set or tied the longevity record for all three species of Rosy-Finch. The oldest birds that have been banded there are 8 years old! Age & Sexing Criteria: How do you tell the birds apart? – Well, telling males from females and young birds from older ones can be difficult. Over the years the banding crew has become pretty darn good at it though and they have learned many defining characteristics that were previously unknown. Molt Strategies – All birds molt their feathers but the timing and order that they molt can be very important to their ecology. The researchers at the Rosy-Finch Project have banded thousands of Rosy-Finches and looked very carefully at each one to determine patterns in molt. Population Fluctuation and Movements: Do the numbers of birds change? Why? – Yes! The number of Rosy-Finches at the Crest changes from year to year and from day to day. It’s possible that these changes reflect the overall population of Rosy-Finches, but more likely the ever changing number of birds is a result of the weather. 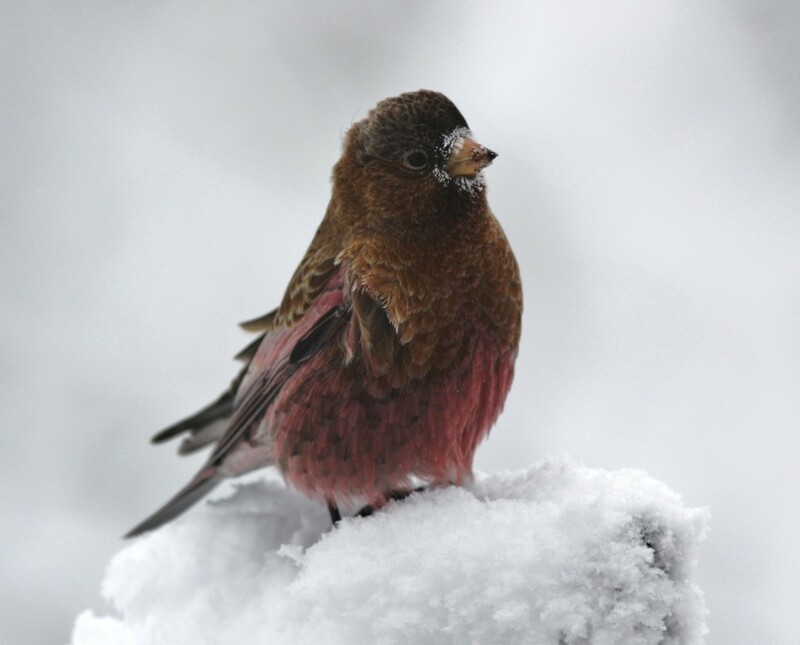 By monitoring the numbers of birds and logging local and regional weather data, the researchers are beginning to correlate certain weather patterns with an increase or decrease in Rosy-Finches at the crest as well as changes in the proportion of each species that they see. Physiological Stresses: How do these birds survive in the mountains? – As anyone who have even been to the Sandia Crest can tell you, it’s cold up there! Nighttime temperatures often fall 10 or more degrees below 0! What’s more, the Sandia Crest is on the very southern edge of the Rosy-Finches range and is likely one of the warmer places where these birds live. Using radio telemetry the researchers at the crest have been trying to pinpoint where the birds spend the night so that they can answer this question. So far they have found out where the birds sleep, in caves and cracks of a nearby, 800 foot cliff! Now they are working out the logistics of accessing those roost sites. If anyone has a spare helicopter laying around the Rosy-Finch researchers sure could use it! Breeding Status in New Mexico – Brown-capped Rosy-Finch has one of the smallest breeding ranges of any bird in North America. The breed only on tall mountain peaks in Colorado, southern Wyoming and Northern New Mexico. But in the past 30 years, the birds are disappeared entirely from the summer homes in New Mexico. The Rosy-Finch Project is trying to find out if there are any birds left breeding in New Mexico and why they have disappeared by conducting surveys on the tall peaks in the state. If they can find out why the birds have disappeared maybe they can help prevent the birds from disappearing in other parts of their range. As stated above, the project runs entirely on volunteer support and is always looking for help. Specifically there is a need to folks interested in helping to do data entry and field work. Anyone interested in learning how to participate in banding, radio telemetry, summer surveys, data entry, etc. should contact Amber West. Rio Grande Bird Research and CNMAS want to invite you to come visit the Sandia Crest, the Rosy-Finches and the the project! The Rosy-Finches are present at the crest from November till March each year and the RGBR is banding birds every Sunday during that period. Come enjoy the beautiful birds and scenery and you may even get to participate in the banding process. Remember that it’s cold up there and the roads are not always safe. Additionally the researchers give frequent presentations about the project all across New Mexico and sometimes further afield. Some of these presentations are paid events but many of them are free.